Dew Point is an interesting and often misunderstood concept. Dew Point is the temperature that air must reach (decrease to) in order for condensation to take place - the Point on the thermometer at which Dew forms. We frequently see this with glasses of ice water. Imagine two identical glasses - one full of room temperature water and one full of a mixture of ice and water. Which one will develop condensation (popularly known as 'sweat' although this is a very misleading term)? Experience has probably taught you that only the glass of ice water will induce condensation, sometimes in significant amounts. The author has even had a cellphone ruined when it was placed next to a glass of ice water in a humid room overnight. The condensation produced by the glass created a puddle that destroyed the cellphone without the water ever being spilled. Why does this condensation happen? Air can hold water in the form of vapor - and warmer air can hold more water vapor. When you fill a glass (and a glass works better than a plastic cup as glass is a poor insulator) with ice, it cools the air immediately around it. This local air is cooled below the Dew Point, and the water vapor from the air condenses. This is actually why mountains cause rain - as humid air from plains or oceans has to rise to cross over mountain ranges, it cools. Depending on the height of the mountain range, it usually cools enough for some of the air to lose water in the form of precipitation (rain or snow). Why is any of this relevant to anything? Well, much of the fresh water available on the Earth is actually in the air. In fact, over 5 times as much water is available in the humidity in the air as is available in rivers on the Earth. 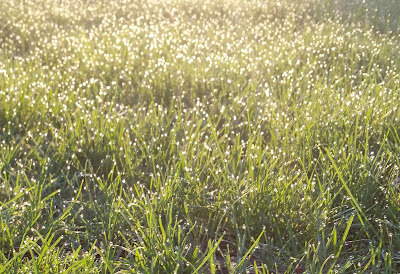 There is sometimes enough dew on the grass to thoroughly soak your morning slippers - can we put this to use? As so little water is available in some areas where trees and other plants need water, a brilliant Dutchman named Pieter Hoff invented a device to use water from the air to grow plants - without irrigation. This device is called the Groasis Waterboxx PlantCocoon®. The Groasis Waterboxx acts acts in several ways. 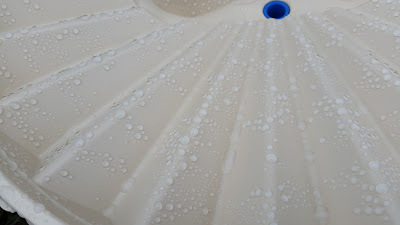 The Waterboxx has a reservoir of several gallons of water that is resistant to swings in temperature due to the high specific heat capacity of water. There is a small air pocket above the water reservoir and immediately below the Waterboxx lid. The water tends to be cooler than outside air during the day and warmer than the outside air at night. When the sun sets and the outside air temperature cools, the air pocket between the water reservoir and the Waterboxx lid is cooler than the outside lid (just like a glass of ice water is cooler than the ambient temperature) causing condensation to form faster and in greater amounts. The Groasis Waterboxx lid is specially designed with microscopic pyramids on top of a funneled, corrugated form. This design mimics the lotus leaf, and funnels as much dew as possible to the central siphons. These siphons direct the water collected as dew into the reservoir, and prevent the water from evaporating during the day. This water is then slowly released to the roots of the growing plant below by a small wick at the base of the green reservoir. This whole process can be seen in the video below. 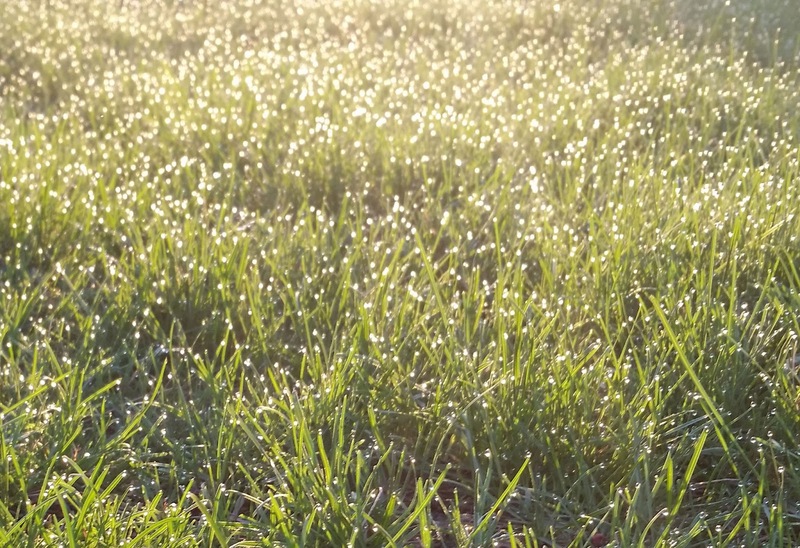 The Groasis Waterboxx will collect dew every night, so long as the temperature of the air falls below Dew Point (allowing condensation to form). It will take up to a year without any rain to empty the reservoir if it is refilled with condensation, when growing trees. Dry, arid climates that are most in need of the Waterboxx generally have the biggest swings in temperature between day and night due to lack of insulating cloud cover. These swings mean the temperature is more likely to go both above and below Dew Point, causing condensation. The Waterboxx works so well in the desert that when used in the Sahara, 88% of single trees (99% of double tree plantings) planted with the Waterboxx survived even though they were never watered again after first planting. Only 11% of the weekly watered control trees survived. You can check Dew Point here if you have relative humidity and temperature handy (available here). Trees transpire a considerable amount of moisture, and a Waterboxx planted tree of any size (but especially broadleaf/deciduous trees) transpires water vapor over the Waterboxx lid. On a windless or nearly windless night, this settles on the lid, slides down into the siphons and replenishes the reservoir. This would be the case even if the relative humidity elsewhere around the tree was so low that the low temperature wouldn't reach dew point. If a tree is established as recommended with the Waterboxx (with 10 gallons of water poured at time of planting into the soil), that is somewhere near 10 gallons that can be transpired, collected, and recycled. This 10 gallons doesn't include the amount in the reservoir at planting and the amount collected from dew and rain. Also, the Waterboxx planted tree may lower the daytime and therefore nighttime local temperature slightly (due to shade and humidity), and the local air may reach dew point that way. Finally, in the beginning of the summer, the water in the reservoir is likely to be cooler than the average air temperature. This will likely cool the small amount of air in the Waterboxx (the air resides beneath the cream colored lid but above the black midplate), making the surface of the cream colored lid cooler and closer to dew point. So, because the Waterboxx planted tree changes the local environmental conditions, the Waterboxx can be replenished even if the surrounding environment is too hot or dry. A Waterboxx lid with significant condensation. This water beads up due to the microscopic pyramids on the Waterboxx lid. A note about published Dew Points. We find these to be quite frequently inaccurate. We have been camping and have had our tent (and the surrounding ground) covered with dew when, by published temperature and dew points, there shouldn't have been any condensation. Dew Points can be highly local (due to differing local water sources) and the only real way to measure Dew Point is to record the temperature outside when dew begins to form on the ground (or other objects). If this all sounds a bit complicated, well, unfortunately that's because it is. That is likely why a device like the Waterboxx, deceptively simple as it appears, was never developed before. You can find out more about the Waterboxx on our parent website, Dew Harvest. You can also buy the Waterboxx here.